A rather chilly and misty start to the day. Jan returned to the bedroom at 7.30 to wake me with a cup of tea. After breakfast she drew my attention to the view from the bow. 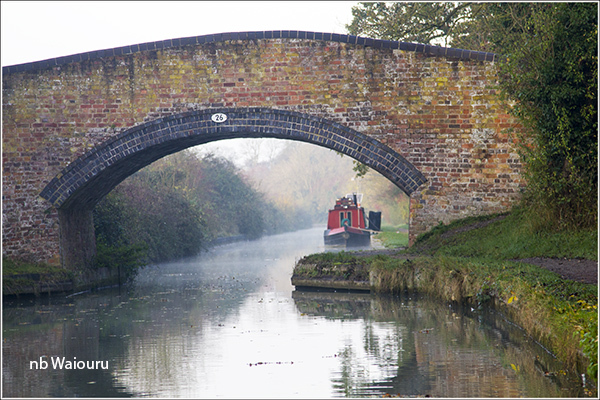 When we moored below Itchington Bottom Lock last night there was only one other boat behind us. However by the time we went to bed a further three boats had arrived and moored. This morning we departed at the same time as the third boat, except it was going in the opposite direction. Actually it was the share boat Benbow which used to be moored at Aldermaston Wharf when Waiouru was being fitted out. 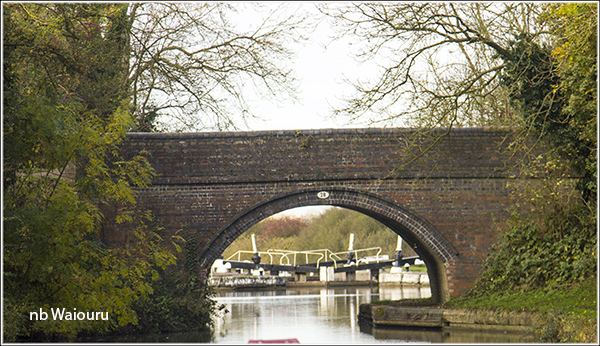 We arrived at Bascote Top Lock to find it empty and realised it was possible all the locks in the flight would be against us. Jan became rather animated as I was steering into the lock. 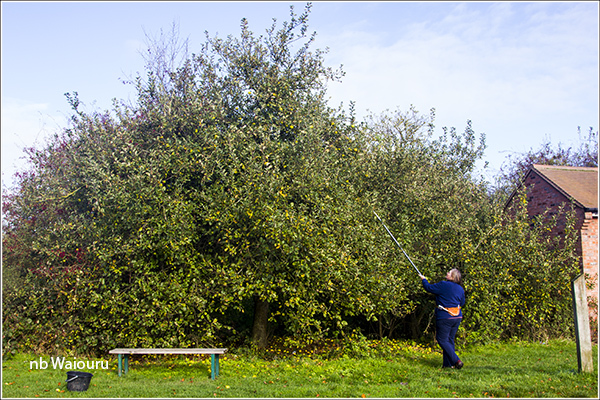 She soon had the boat hook and was off collecting apples from the tree beside the towpath. All of the low hanging fruit was either on the ground or had already been picked. However the hook on the end of the boat hook is excellent for pulling the fruit off the tree. By the end of her foraging she had half a bucket of apples. 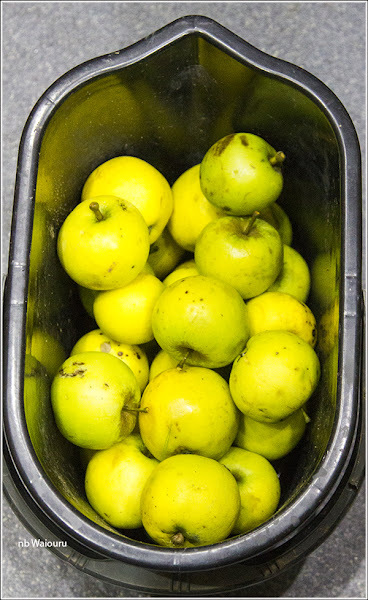 Should be sufficient fruit for at least two large apple pies! 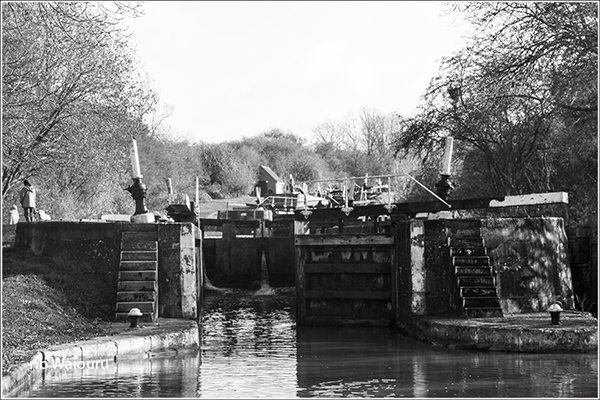 The bottom lock was in our favour but a boater appeared from below and turned it against us. Jan politely mentioned to him that we had set it to enter and his gruff reply was “I didn’t see you!” Jan was about to mention SpecSavers but decided it wasn’t worth the effort. The hedgerow between Inchinton and Royal Leamington Spa must have more fruit trees in it than anywhere else we have seen on the network. 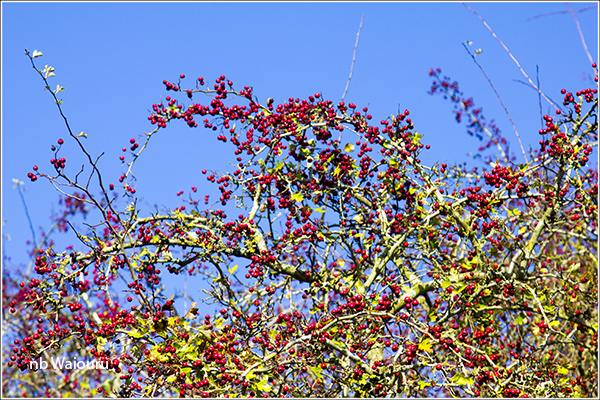 The locals have also mentioned that this year there are plenty of berries which means it will be a harsh winter. Or so they say! After three hours of cruising I was rather regretting my decision to wear a thin Tshirt with lightweight fleece and shorts. It started to get rather cold when the sun disappeared. Jan decided to give me a cuddle to warm me up. The cuddle was nice but in the end she became more practical and got me a second fleece. The plan was to moor at Lidl and do some food shopping. 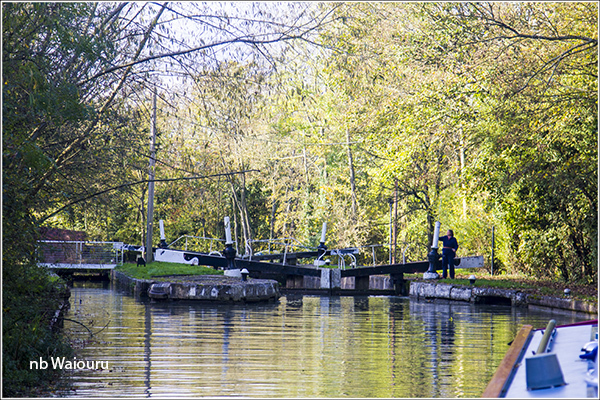 However others had beaten us to the moorings and had nicely spaced themselves out. 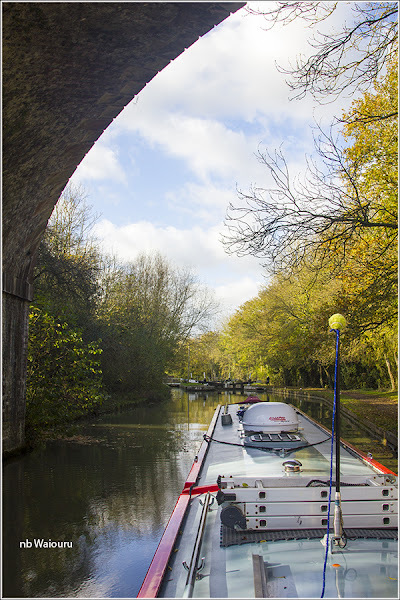 We pushed on in the hope of getting a mooring beside Tesco. As we rounded the bend a CRT Volunteer Towpath Party was just finishing cleaning up the mooring. It now looks very nice. 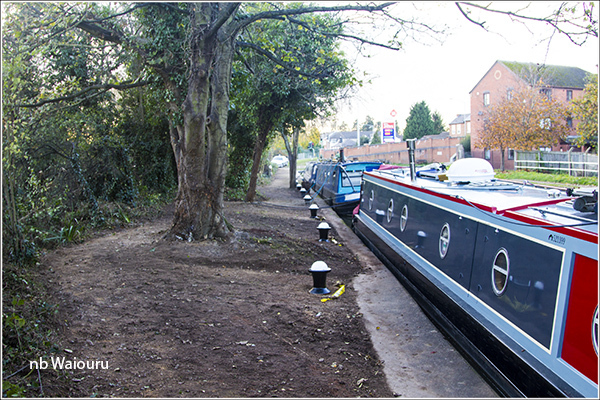 The only thing we can’t do is use the mooring bollards as they all have a fresh coat of wet paint. There was ice on the exterior of the boat this morning and I expect we will see the same tomorrow. Both of us were rather cold after spending five hours on the back of Waiouru. So we started the diesel stove and warmed ourselves before heading to Tesco for some essentials. The boats ahead of us were here when we arrived on these 24 hour moorings and it will be interesting to see if they depart before us!